VAUX SUR MER. 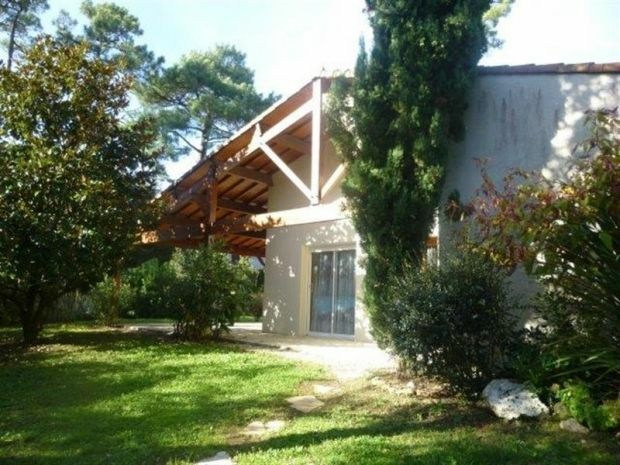 Detached property in the heart of the 'Domaine des Fées', a private residential park just 350m from Nauzan beach and 1600m from the shops in St Palais. Living room with flat screen TV and fireplace opening out to the covered terrace and walled garden. Open plan kitchen with 3 ring ceramic hob, oven, microwave, dishwasher, small fridge). Bedroom 1: Double bed of 140 and cupboard. Bedroom 2: Twin beds of 90 and cupboard. Bedroom 3: Double bed of 140 and cupboards (carpeted floor). Bathroom with shower and bath plus bidet. WC with w.machine. Garage with second fridge with freezer compartment and gas cooker. GARDEN FURNITURE - BBQ - SMALL PETS ALLOWED - SLEEPS 6. Baby equipment available: travel cot and high chair. Quiet area within close proximity of the coast, beaches, restaurants and bars, Sentier des Douaniers coastal path. Quiet area with nearby: the sea, the beaches, the restaurants and bars, the path of customs.